Navigating the cluttered world of cutlery, cookware, and crockery can indeed be a difficult affair especially if you want to prepare a delicious meal. For this reason we have taken the trouble to highlight one of the leading brands in cookware. Cookware are the pots and pans that have become an indispensable part of any kitchen today. With more than enough recipes to experiment with on the Internet in addition to TV cooking shows, you need a set of cookware that will help you take advantage of this cooking revolution. Speaking of cooking shows, don’t you always marvel at the sort of cookware they use? Well, the aim of this article is to bring to your attention that there is no reason whatsoever why you should not have the same or better cookware in your kitchen, and no! It does not cost a fortune. When it comes to cookware, most households will tend to have a bit of this and that bought separately and although they do get the job done, they tend to always leave you desiring for more. One of the best way to elevate and accentuate your kitchen cookware is to invest in a cookware set such as the Duxtop/Secura SSIB-17 Induction Cookware Set. This set will literally transform your kitchen and the way you cook. One immediate benefit is that they style up your kitchen because of the uniformity in elegant design. Second is the availability of varied options whenever you need a different size of pots or pans for re-heating or cooking a meal. Most cooking enthusiasts more often than not find themselves not being able to try some recipes to perfection because the cookware lets them down. It’s time to bring out the chef in you by investing in a set of Duxtop/Secura SSIB-17, and you and your family will notice the difference in the cooking instantly. 1 What is all the rave about the Duxtop/Secura SSIB-17 Induction Cookware Set? 2 What does the Secura/ Duxtop 17 piece set cookware comprise of? 5.1 What gauge of stainless steel is used on the frame? 5.2 Are the pieces contained in this set really 17? 5.3 How is this induction ready without containing iron? What is all the rave about the Duxtop/Secura SSIB-17 Induction Cookware Set? Secura is a well-known and reputed North American brand that deals in the manufacture of small kitchen appliances. They also go by the name Duxtop which is a mark of quality focusing on design, durability, high quality material and affordability in kitchenware. 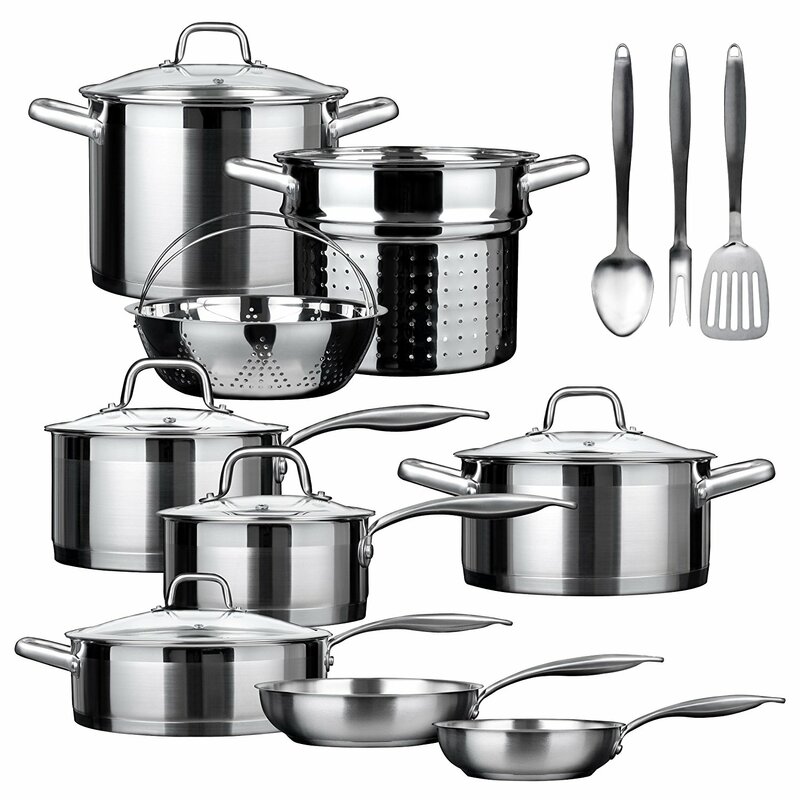 Below we take a look at the dominant features of this 17 piece cookware set. Although design and aesthetics do not supersede quality and practicality, they do have their place in giving your kitchen a sense of style. Secura understand this and they have crafted a cookware that performs but also looks great while doing so. The lids for example, make it easy to monitor your cooking process as they are made of tempered glass with a venting hole and a unique stainless steel seam that allow them to fit snugly on a pot adding to their durability. The slow conduction riveted handles make for easy holding and lid lifting so no chance of burning or scalding yourself. All these soft touches gives this set a different feel and look all the while complimenting performance. This set is classified as professional cooking grade caliber not only because of the design but also because each piece has been purposefully crafted for durability and performance. In any quality cookware, the base is very telling of its conductive capabilities. The base of this set has been engineered to enhance conductivity and heat distribution by including a heavy gauge impact bonded aluminum disc on the bottom. This is built to last a life time. You might wonder how aluminum is bonded to steel. It is vital to understand that no form of adhesive is used in this process ensuring that the pot is absolutely safe for cooking food without the risk of contamination from toxic elements of heated adhesive. The commercial 18/10 gauge stainless steel is bonded to the heavy gauge aluminum through pressure and friction of an impact bonding machine to form a seamless long lasting bond with zero percent chance of leakages. What does the Secura/ Duxtop 17 piece set cookware comprise of? What gauge of stainless steel is used on the frame? 18/10 heavy duty gauge that is built to last. Are the pieces contained in this set really 17? How is this induction ready without containing iron? It contains an aluminum disk sandwiched between two layers of stainless steel. The bottom layer is magnetic thus making this cookware induction ready and compatible with induction stove tops. It’s easy to see with the above mentioned features of the set, why Secura/Duxtop is held in high regards when it comes to quality. This generous 17 set cookware would certainly bring new life to any kitchen while elevating your cooking to a pleasurable experience as you try out some adventurous recipes. This set is built to last a lifetime and there is no chance you will be disappointed.